In response to potential plans by several ISPs and content providers, mainly media streaming services, to transmit and deliver some Internet content at faster speeds in exchange for fees, many activists have voiced concerns that prioritizing certain web traffic for profit will be highly detrimental to consumers. Proponents of strong net neutrality guidelines assert that allowing content providers to pay for faster and more direct access to consumers would make the Internet a closed platform that stifles innovation, allows small technology start-ups to be crowded out of the market, and lets ISPs block or delay certain Internet traffic for political or economic reasons. On May 15, 2014, the Federal Communications Commission (FCC) voted to move forward with a new set of rules regarding net neutrality and begin a four-month period of public comment and response. While these rules would prohibit ISPs from knowingly slowing any form of Internet traffic, they would also allow ISPs to charge content providers for premium, “fast-lane” access to consumers. Net neutrality advocates, however, still maintain that this would effectively allow Internet traffic discrimination, and some opponents claim that this is an issue best decided by elected representatives in Congress, rather than the government-appointed members of the FCC. The GOP Tax Plan and Reconciliation. More info. While discussing the GOP tax plan, Rep. Donovan mentions the process by which the tax bill would be brought to the floor. Here, he is describing the process of reconciliation, which was most recently used by GOP congressional leadership (led by Mitch McConnell and Paul Ryan) to try and move the ACA repeal through Congress without needing 60 votes in the senate. We believe Rep. Donovan’s statement about his “asks” not being in either version of the bill refers to the Byrd rule, which places limits on legislation that emerges from the reconciliation process. It is important to remember that with both houses of Congress under GOP control, Republican leadership would control membership of the the special committee. Context. While Rep. Donovan engages in some good-natured teasing with a constituent who clarifies that by “right to life” she means “right to adult life,” it is important to remember that Rep. Donovan has gone back on his original campaign promise not to put federal legislation between women and their doctors when it comes to reproductive rights. He voted “yes” to ban abortions after 20 weeks (with extremely limited exceptions), thereby placing the federal government in a position to overrule a woman’s personal reproductive health choices. This is also relevent given his later claim, “I will never lie to you.” We’re not sure how he categorizes doing a 180 on his position re: women and reproductive rights. We may not agree on the definition of “lying”. Context. Shortly after the passage of the AHCA (which he opposed), Rep. Donovan published his thoughts on how Health Care reform could be “kickstarted”. He did not offer specific information on the progress of these points during Sunday’s discussion. More info. The NYS Excelsior Scholarship is a new program put in place by Gov. Cuomo, with some PR assistance from Senator Bernie Sanders. The scholarship is available to all New York State residents whose families earnings fall into the middle class. While the scholarship is useful for full-time middle-class students, it does not provide relief to part-time students, or help pay for room and board or books. While it is a start, it is not true universal public higher education, and New York must do better. In reference to the Congressman’s comment about programs like this needing to be paid for: the idea of requiring graduates to stay and work in NYS for five years is that it keeps an educated, prepared workforce in the NYS economy. Since students would no longer have to pay off steep loans, they would be able to spend their money getting onto the property ladder, increasing their savings, or within the local economy. The program is also intended to create a more qualified and desirable workforce within the state, making us more attractive and competitive to employers. Over time, the idea is that this investment in the state’s young people and their educations will pay for itself thanks to increased economic activity and the taxes that are paid along with it. Fact check/context. While Rep. Donovan cited the effect of the Estate Tax on small family farms and businesses, he neglected to bring up the ultra-rich, who would also avoid paying taxes on inherited wealth worth billions. The small farmers and small businesses he mentions are a very small percentage of those affected by the estate tax, and there is no reason the legislature couldn’t address that issue without also cutting taxes on the wealthiest members of our society. While his answer is true, it omitted pertinent details. Fact check. During his first campaign for Congress, Congressman Donovan promised he would never place federal legislation between a woman and her doctor. One of his first votes was to vote in favor of a bill to dramatically restrict (and in essence, ban) access to abortion after twenty weeks. He repeated that vote last month when he voted yes on HR36. Please revisit point #3 regarding our apparent disconnect on the meaning of “lie”. We applaud Congressman Donovan for arranging this district-wide tour. One charming point about these small meetings is that the questions and interactions can vary based on the audience. Since not everyone can go to every meeting, we’re glad to be able to provide this recording, and hope you’ll use it to inform your questions at one or both of next weekend’s coffee meetings. 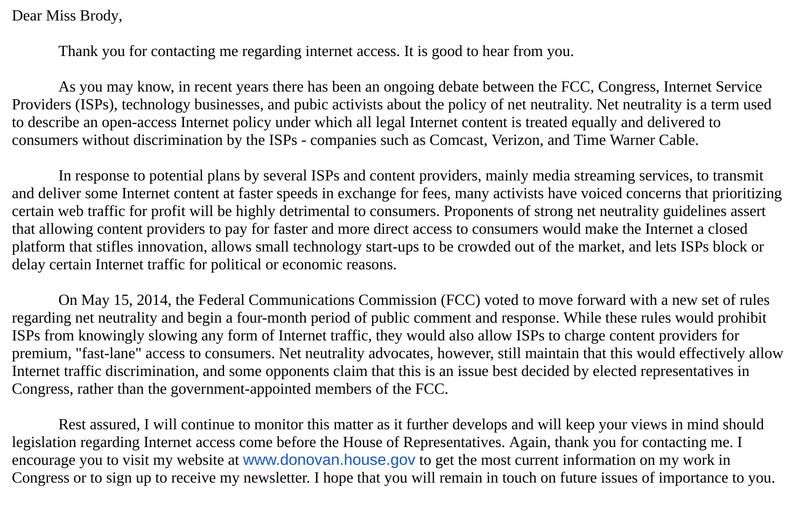 With Congressman Donovan going on record to say that he supports the current “Travel Pause” (aka Muslim Ban 4.0), members of our community might like to come and ask him to discuss this further. Saturday, November 18th – 2:00 p.m. – 4:00 p.m.
Sunday, November 19th – 1:00 p.m. – 3:00 p.m.
To communicate with Congressman Donovan’s office, we refer you to his website. He has offices in Brooklyn, Staten Island, and Washington, DC. He maintains two twitter accounts, @RepDanDonovan and @donovan_ny, and facebook pages Dan Donovan for Congress and Rep. Dan Donovan. We encourage our neighbors to stay up-to-date on the messages posted at each URL. You are a liberal crumb. As someone who grew up in Bay Ridge, I can say that liberals like you will only serve to send that neighborhood downhill. What a shame. Hi Donald! Thank you for listening and taking the time to leave us a comment telling us how you feel. We appreciate your effort!